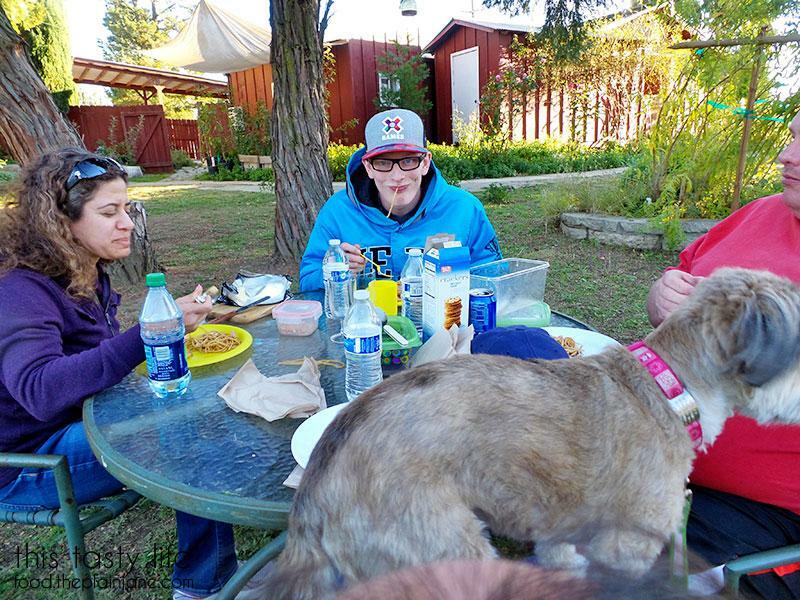 Last weekend Laura, Jake, T, Maya and I headed up to Julian for our annual trip to the mountains. It finally feels like fall in San Diego, hooray! 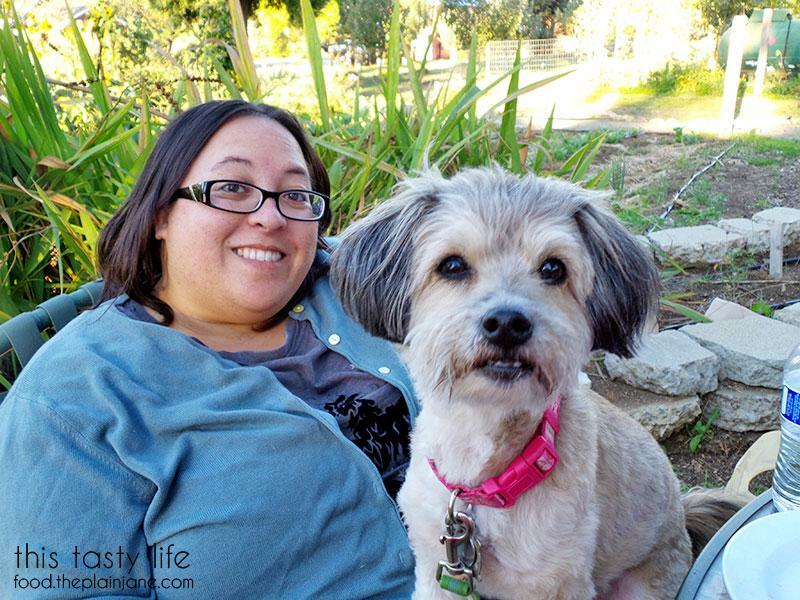 A nice walk in Julian would be good since I started using a Fitbit last week – I need all the steps I can get! The only downside was there were SO MANY people with the same idea as us and the streets were pretty crowded with folks milling around or waiting in lines to get their fix of apple pie. 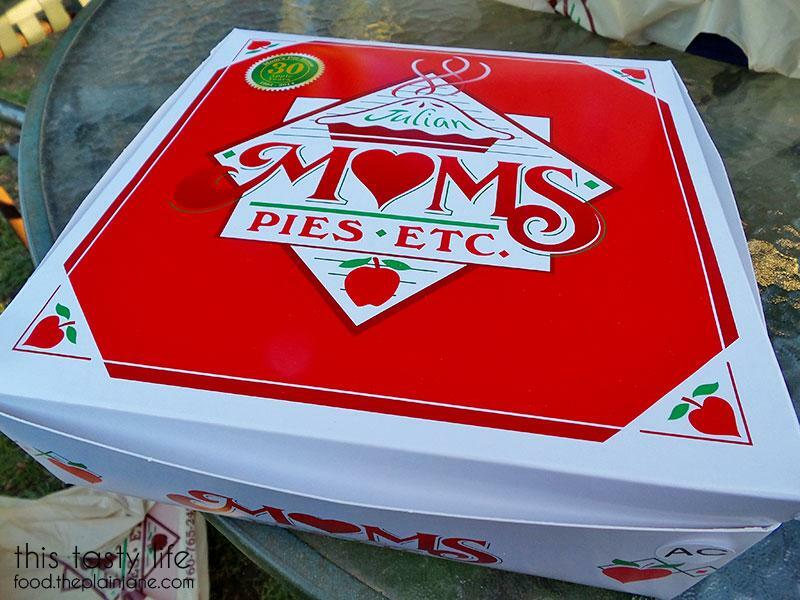 After we walked through town, we decided to hightail it out and head over to the Mom’s Pie’s shop located just outside of town. I had packed us a lunch since dining in Julian hasn’t turned out so well for us in the past. I preferred bringing along something I knew we’d all enjoy. Last year I made something similar – the difference is this time I winged it and made my own dressing for the noodles and used a short cut for making the chicken. 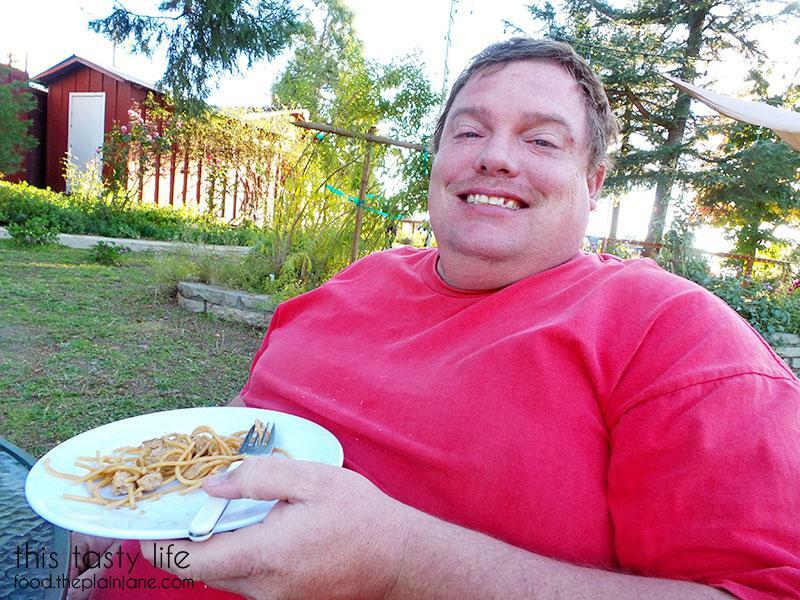 Here’s Jake enjoying some of the sesame chicken noodles. 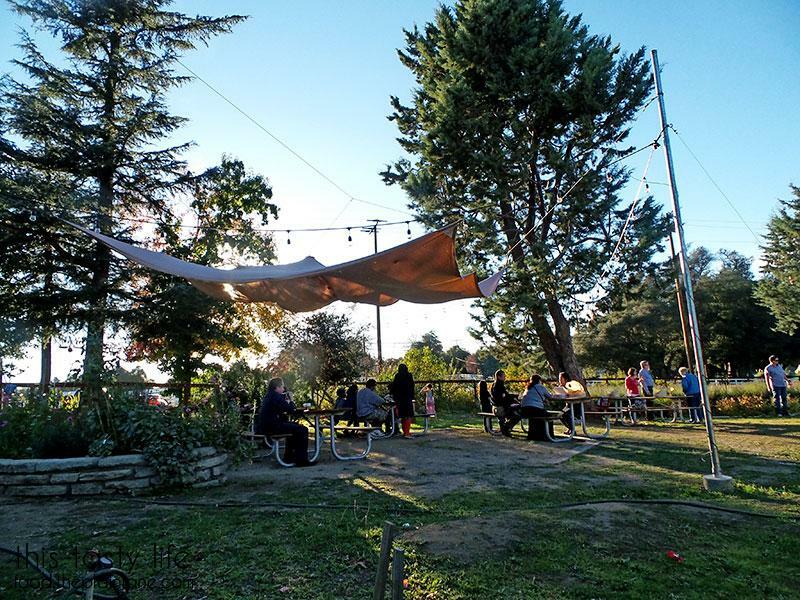 Right outside of Mom’s Pie’s shop there’s a garden area with apple trees, lavender, sunflowers, and some vegetables. There are picnic tables out here so you can enjoy your pie and in our case, some lunch! Maya got antsy when we were just sitting around eating so I walked her around the garden at Mom’s. 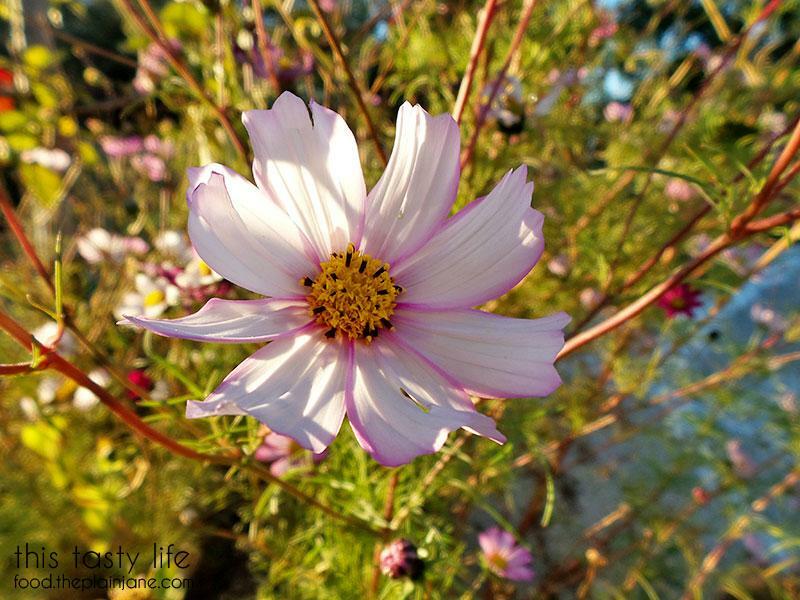 There were a few flowers in bloom – I can only imagine how it would look in the spring! 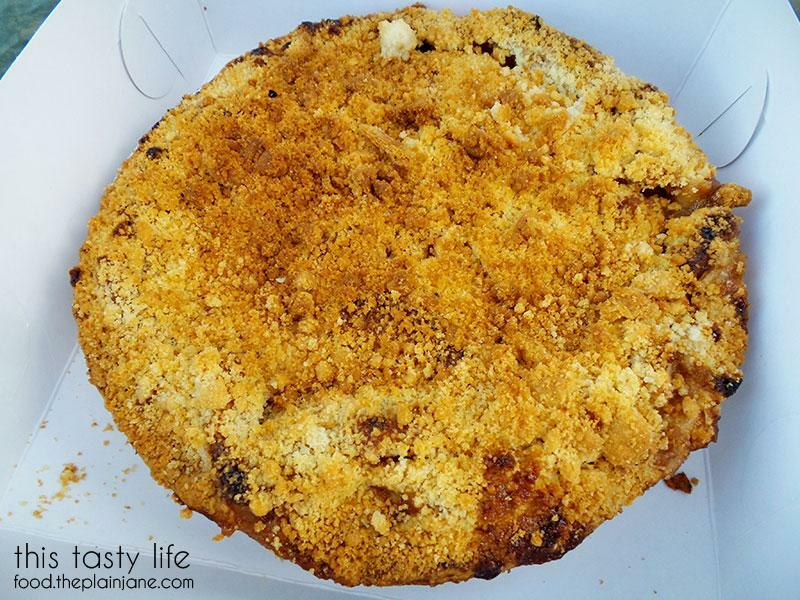 The Apple Crumb pie is the one I always get! 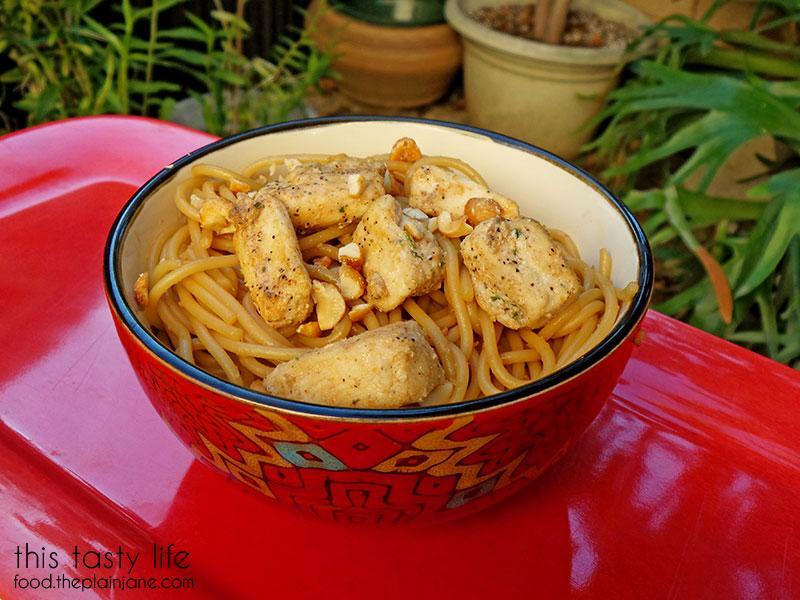 Now here’s a peek at how I actually made the sesame chicken noodles for the picnic. My chicken “trick” was to use some Foster Farms Sauté Ready chicken. The chicken is garlic herb marinated and I figured it would taste pretty darn good with some sesame noodles. Foster Farms also offers Fajita and Asian Style as flavor options but a little garlic herb action sounded the best to me. The bags are 1.75lbs of marinated chicken breast. The pieces are cut small for fasting cooking (awww yeah). I made my sesame dressing first. The crunchy Laura Scudder’s peanut butter is in the photo but I actually used smooth Skippy’s peanut butter instead (because it was nearly empty). Ginger and garlic. Gosh they look alike in this photo. 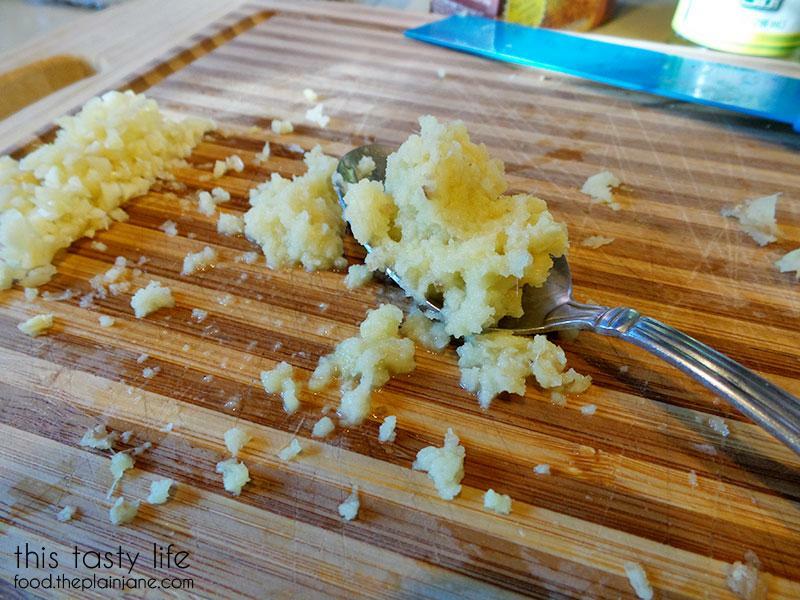 The ginger is in the spoon and is finely grated while the garlic is minced fine. You don’t want big pieces of these in your sauce! No one wants to bite into that. It ain’t pretty but it sure tastes good! The chicken was super easy to prepare – I just heated up a little bit of olive oil and put the chicken in straight from the bag. The chicken doesn’t need to thaw either which is another time saver. In about 10 minutes the chicken was done and ready to add to my sauced up noodles! And chicken! I’m not usually a fan of white breast meat, either, but these pieces were really tender and flavorful. They added a nice element to the noodles. The crushed peanuts on top made the sesame chicken noodles even yummier to me. Make sure to only add the peanuts before serving otherwise the nuts can get a little soggy. The other cool part of this dish is you could serve it hot OR cold. I had a little sample when it was warm and it tasted just as good when it was cold. Winner, winner, chicken dinner! Prep the sesame sauce by mixing together the first nine ingredients with a whisk. Set aside. Cook the spaghetti according to package directions. Drain and rinse with cold water. 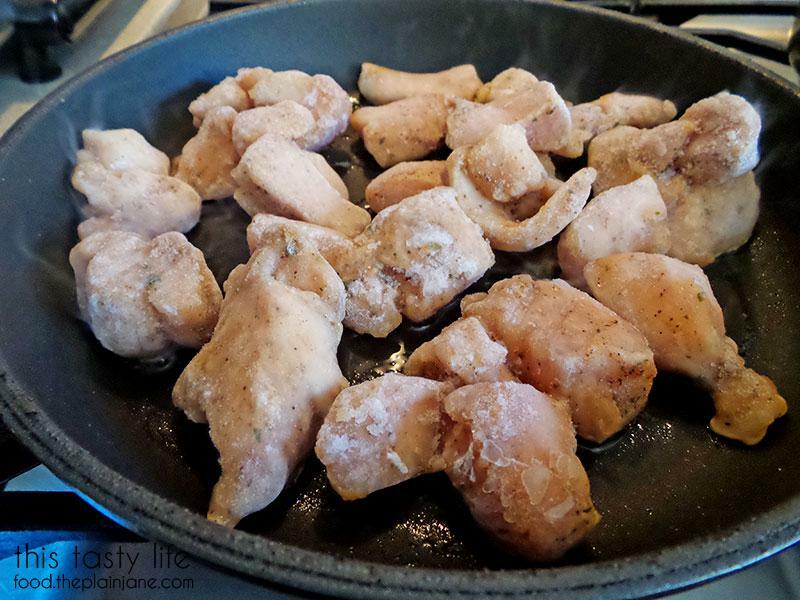 Cook about 1 lb of Foster Farms Saute Ready chicken in a little bit of olive oil in a saute pan. Cook for about 10 minutes or until the inside of the chicken is no longer pink. 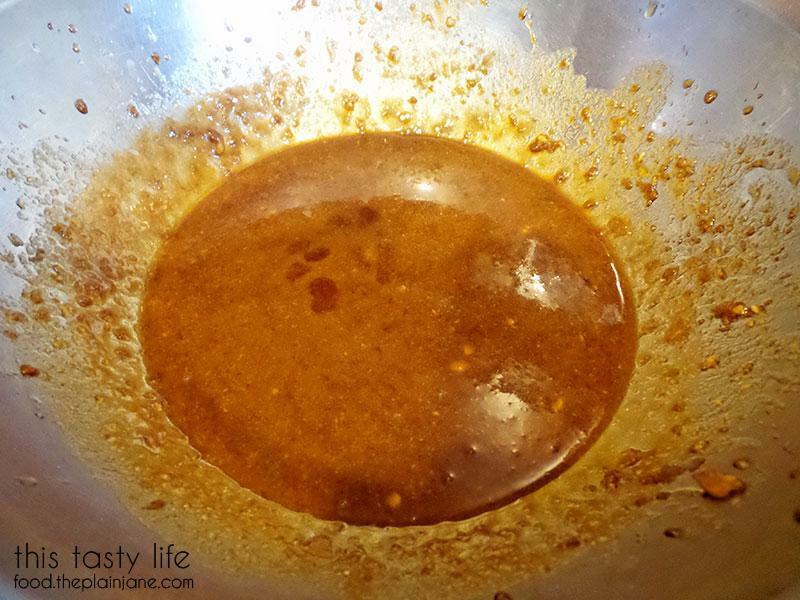 Mix warm noodles with sesame dressing and toss until completely coated with sauce. Add chicken and toss again to distribute. 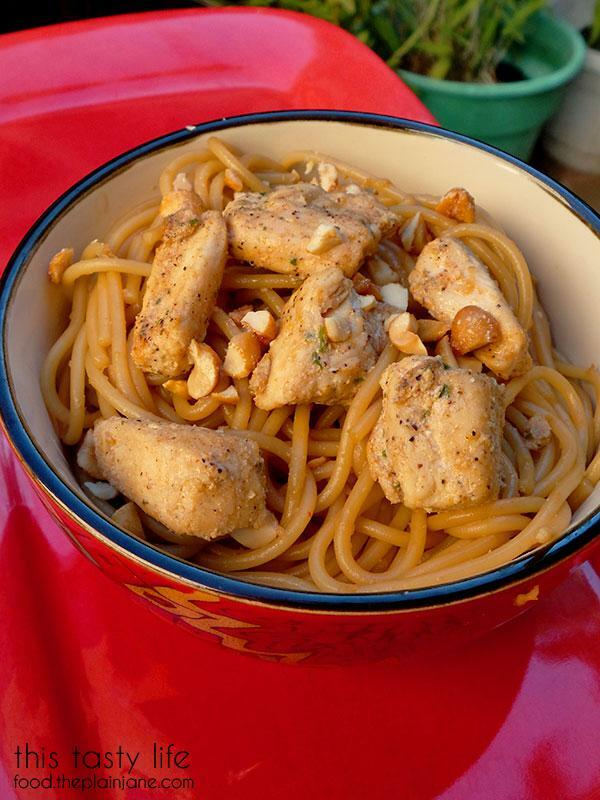 Serve with chopped honey roasted peanuts. 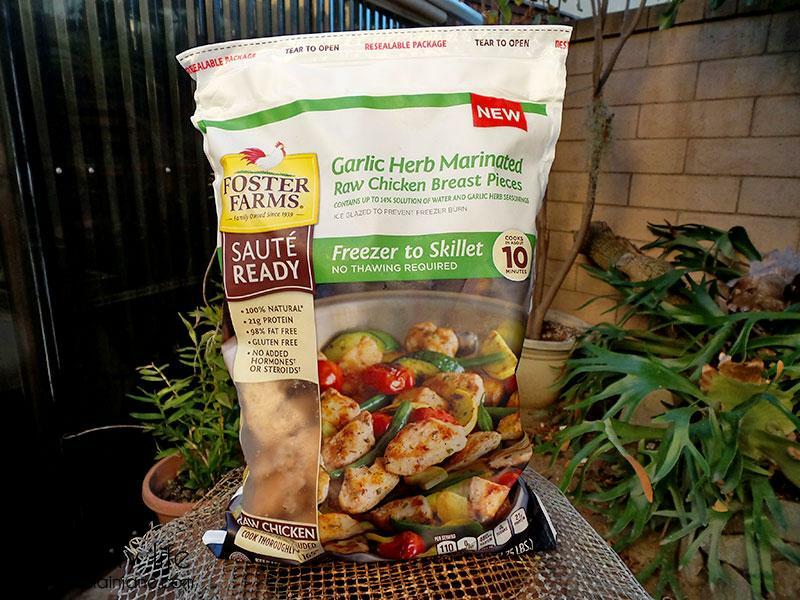 Are you interested in trying out Foster Farms Sauté Ready chicken for yourself? Well you’re in luck since I have a few coupons to giveaway! 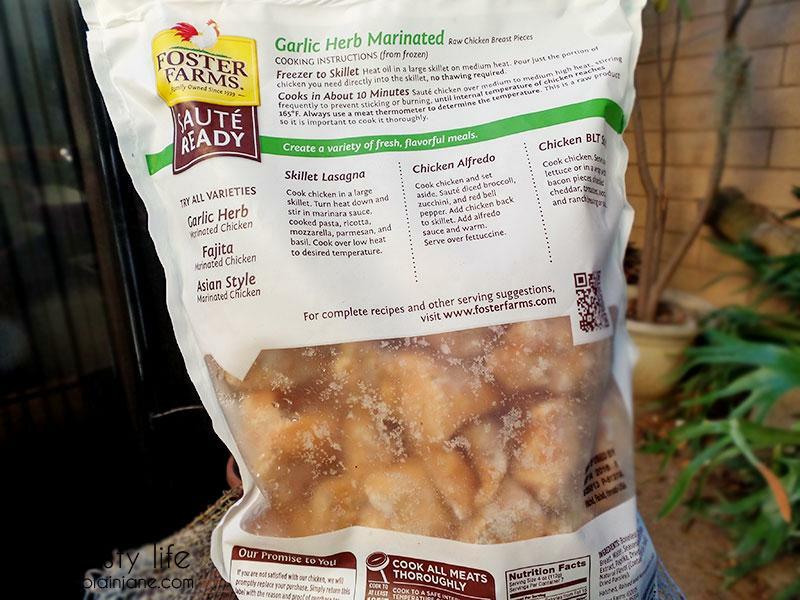 I have 3 coupons to giveaway to 3 lucky readers for one free bag of Foster Farms Sauté Ready chicken and my question to you is – which of the three flavors would you like to try and how would you cook with it? Just comment below for a chance to win and I’ll randomly pick three winners to receive coupons. Make your comment below by 8PM PST on November 20th, 2015. Valid only for US residents. Good luck! Update: Thanks to everyone who entered and congrats to Dianne, JoeyfromSC and Jess! I will be contacting the winners via email. Disclaimer: I received a complimentary bag of Foster Farms Sauté Ready chicken to sample along with a gift card and coupons to giveaway. All opinions stated here are my own. Garlic Herb Marinated would be my choice, as it sounds most versatile. I’d add it to pasta with marinara sauce, or a sautee of vegetables and cubed potatoes. Yum! oooh….Garlic Herb Marinated sounds good. My Honey would enjoy this! I would probably cook it up along with angel hair pasta with some cherry tomatoes and spinach tossed in and maybe a light pesto sauce. I would like to try the Asian version of this chicken. Looks like a super quick supper with some stir-fry fresh veggies! 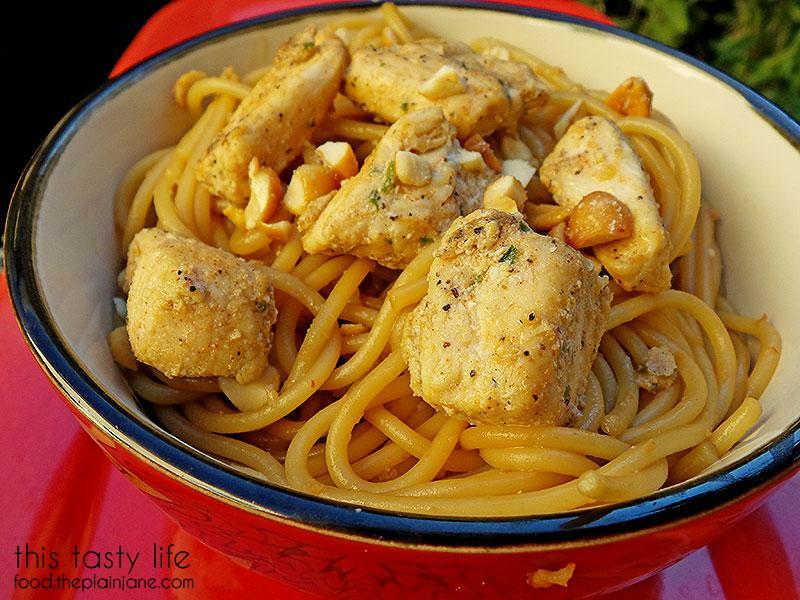 I’d like to try the garlic herb marinated & I think I’d make it with pasta and veggies! yum! Garlic Herb Marinated is right up my alley. thanks for the giveaway! 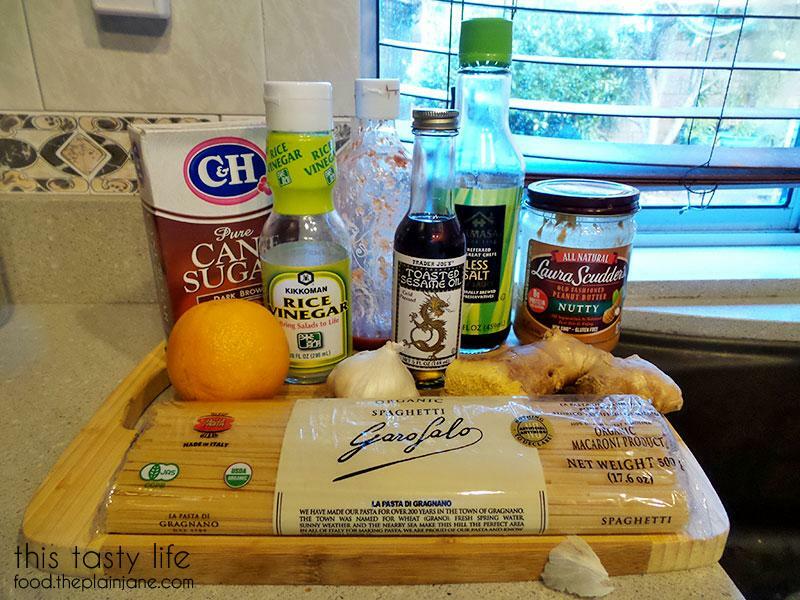 Asian style, for a quick stir fry! I’d like to try the Asian style; I would make it with soba noodle salad. I would like the Asian flavored one and I would use it in one of the many chicken stir fry dishes that are a favorite at our house! Like Beef & Broccoli maybe. I would use the Asian style to make my Phad Thai with homemade peanut sauce and spaghetti squash noodles. I would like to try the Asian version in a skillet with some veggies. WOOHOO! thanks so much. I replied to your email:) Congrats to the other winners!! Hi Mari – I just use my cellphone’s camera – I have a Samsung Galaxy S7. Cheers.